How to Clean a Hippopotamus: A Look at Unusual Animal Partnerships by Steve Jenkins and Robin Page. Grades 3-6. Houghton Mifflin Books for Children, May 2010. Review copy provided by publisher. 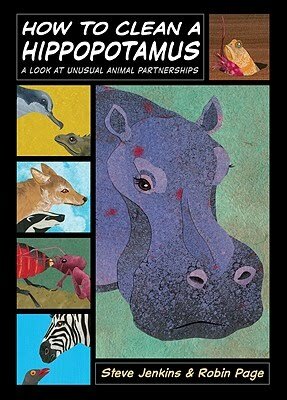 How to Clean a Hippopotamus is all about symbiotic relationships - partnerships - in the animal world. You probably know about a clown fish's relationship with an anemone. The clown fish, immune to the sting, lives in the anemone, keeping it clean in exchange for protection. But their relationship is actually a little more complicated than that. For one thing, each clown fish is only immune to their anemone. Another anemone, even of the same type, will still harm the clown fish. For another thing, the clown fish has to build up its immunity by brushing lightly against the anemone's tentacles, gradually increasing its contact until it's not harmed by the sting. If the clown fish leaves the anemone for more than 45 minutes or so, it will lose its immunity and have to start all over again! And in exchange for protection, the clown fish also lures other fish to the anemone. Now you know a little more about clown fish and anemones*, but did you know that sometimes badgers and coyotes work together to hunt prairie dogs? You may know about some species of fish that clean predator fish, but did you know that African helmeted turtles clean hippos in exchange for supper and a spot to sunbathe? Or that black tree ants and rufous woodpeckers make a truce and share a nest when it's time for the bird to raise chicks? The cut-paper collage illustrations are laid out in comic-like panels, a layout that I found very appealing. And it's amazing how much information the authors were able to cram into a slim book (without it being overwhelming). Sections at the back of the book give additional information about symbiotic relationships and about the animals pictured (such as where they live, what they eat, etc.). Hand this one to kids interested in nature and animals and they'll be sure to eat it up. Check out more reviews at A Patchwork of Books, A Year of Reading, and Kids Lit. How to Clean a Hippopotamus is on shelves now. Happy Nonfiction Monday! Go check out the roundup at 5 Great Books. *And I think I have learned how to spell "anemone".